WETHERSFIELD — Getting the bounces. 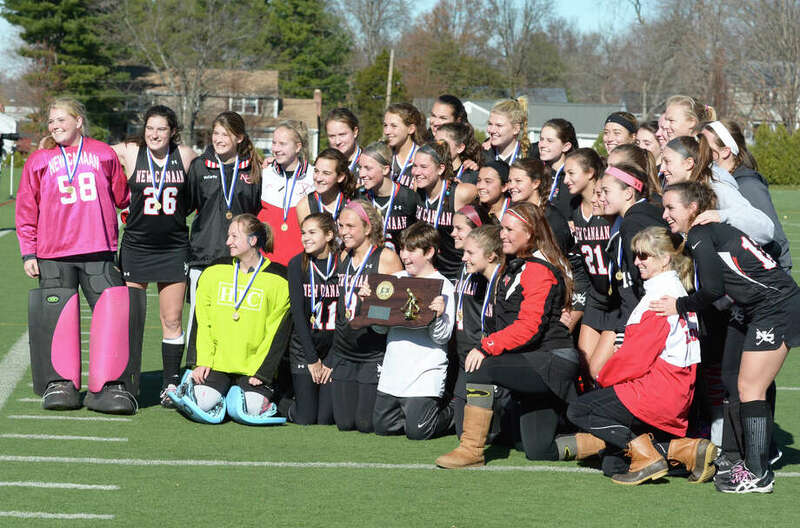 For New Canaan and Joel Barlow that’s what the Class M championship came down to. The Rams got one more bounce than Barlow and Camaren Dayton made it count; flipping a shot in to the back of the cage five minutes into the second half for the only goal of the game in a 1-0 win for New Canaan. For the Falcons it was the opposite story, they just couldn’t quite get the right bounce at the right time. Barlow and New Canaan played even for the entirety of the match and with eight minutes left Barlow got its chance to tie. The Falcons had five penalty-corner opportunities in the final eight minutes but were unable to capitalize, partially due to bad luck and partially because of the stout defense of the Rams, led by Catherine Granito, Tigger Nesbett and goalie Emily Conley. Those waning moments were stressful for Gildea, who paced the sidelines frantically while barking orders to her players. Those zeros finally did flash on the clock at Wethersfield High School and the Rams stormed the field with their first state title since 2003, when Gildea was actually a member of the team. Despite the loss, Chapin said she has no disappointment and was holding back tears while recalling the season that propelled her team into the finals while seeing it win an SWC title. Goals: NC—Camaren Dayton. Goalies: NC—Emily Conley (4 saves); JB—Tatiana Naclerio (3). Shots: NC—4; JB—4.